How to get there: The starting point for this trip was Lake City, a small town about 55 miles from Gunnison (Hwy 149 running south from Hwy 50 at the east end of a lake which is about 9 miles west of Gunnison along Hwy 50). In Lake City, go west on 2nd. street and follow the road with the sign Engineer Pass (Henson Creek Road) for about 8 km. There is a sign reading Nellie Creek Road for a 4WD road that forks to the right. This road was closed by snow. Route description: We skied up Nellie Creek Road, climbing steadily on the right side of the creek. The road crosses the creek and forks after about 3 km, with a cliff rising in the middle. Take the left fork (the jeep-road makes an almost 180 degree left turn here). The trail continues first on the left side of the creek, then on its right side reaching a flat, somewhat wide valley area before climbing gently through some more trees to the (summer) 4WD trailhead. From here one continues up the main valley, the tree line is quite distinct. The summer trail makes a big bend left in order to gain Uncompahgre's south ridge, however in winter it seems best to ski directly to the very distinct notch just left of the peak itself (4110 m). We left the skis in the notch and climbed the snow slope quite close to the steep cliffs facing west. This slope ends in a wide, flat shoulder that can be followed (a bit to the right) back to the south ridge. The west facing slopes of Uncompahgre are considerably less steep here and the most practical winter route continued a traverse climbing only gently onto the west slopes until a scree area that then could be used to regain the south ridge. Again, the ridge is broad and quite level, then there is one more "step", short, but fairly steep snow before reaching the summit plateau. The summit area has a gentle slope and the highest point is to the north, right next to the north face of the peak, a quite steep cliff. Comments: I did this trip with my 19 year old son Tor Erling. We drove from Boulder to Lake City in the afternoon, April 12th (5 hours), then started skiing at 6 AM on Friday the 13th (Easter Friday). A white cat ran across the street, clearly a sign of good luck! The weather turned out to be fantastic, not a single cloud anywhere all day. The morning temperature was cold, minus 10 C (or colder? ), we broke trail all the way. On the jeep-road, this was relatively easy, but as we got higher, the snow got deeper. Above tree line we sank into about a foot of fresh, dry Colorado powder at its best. Due to a minor navigational error we climbed the ridge north of the basin and followed this ridge to the base of Uncompahgre, no loss of altitude, but a slightly longer route. The skiing up to the notch at 4110 m was hard work in the deep snow. It took us 2 hours to reach the summer 4WD trailhead, another 4 hours to reach the notch and 1.5 more hours to the summit. The steep slope from the notch was loaded with snow, every step would sink in almost one meter. Our route avoided avalanche danger by staying close to the steep cliffs. The summit was warm and without wind. The views unbelievably breathtaking. South and south-west the mountains just continued endlessly. The complete Sawatch range clearly visible towards the east. Blue sky, sunshine, only two humans to experience it all, we spent considerable time just looking around. The return to the notch took about 30 minutes, the ski to the jeep less than 1.5 hours. The whole basin from the notch to the 4WD summer trailhead consisted of 30 centimeter fresh powder on top of a good base of snow, it is not often you ski this kind of conditions without anybody else, not a single track but ours! Total trip time, 9:45, 7:30 up and less than 2 hours down, rests included except for 15 minutes at the summit. Skiing at 4110 m may be my highest skiing ever. Uncompahgre The Monarch of The San Juan, seen from Sunshine Peak on July 6., 2001. Uncompahgre seen from the ridge north of the basin. We skied to the distinct notch just left of the peak. 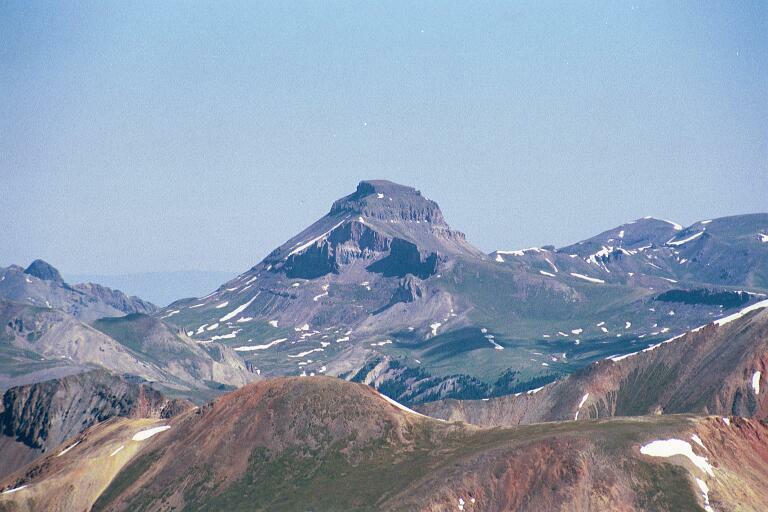 On the summit of Uncompahgre, Wetterhorn behind. View north,, this is Precipice Peak, 4006m. West slope, we traversed to the snow far left on the picture, then regained the south ridge (up right). Coxcomb (4162 m), as seen from the notch. The notch (4110 m), the route can be seen near the cliffs. Skiing from the notch,, 30 cm dry powder and a happy skier.